Beistle issued the cheerful band of brothers in these formally designated sizes, all non-embossed on flat stock, medium cardboard: five inch, eight inch, eleven inch, sixteen inch and 20 inch, all with easel backs, although there are variations to size with nearly all of them, sometimes as much as one and one-quarter inch. The smallest size was made for several seasons more than all of the others. This smaller size had three iterations and was generally sold in envelopes with quantities ranging from five to ten per envelope. This particular size is the most commonly seen today. The larger sizes are less common and harder to find in today’s market, especially the largest measuring 20 inches high. 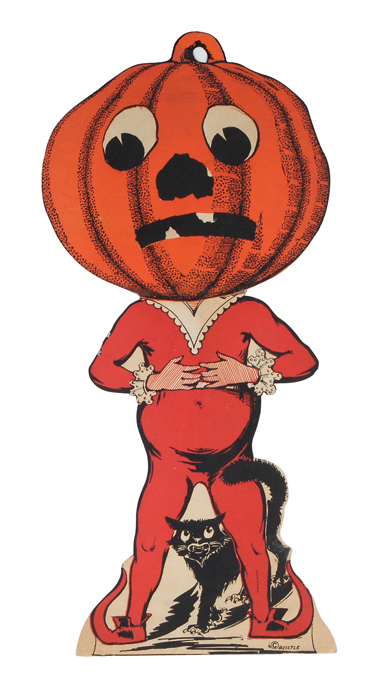 Beistle didn’t take great pains in differentiating designs within sizes. Sometimes the differences are obvious but sometimes they were subtle variances in the appearance of the neckline, lace or collar. Beistle was seemingly ill prepared for the success of this product line, and mass-producing them with limited quality control relative to exactly how the designs by size were reproduced. This issue becomes even more obvious when comparing the various examples. 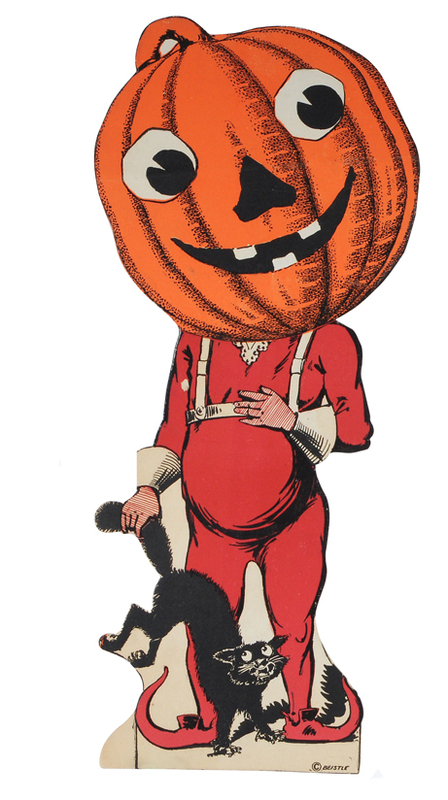 Beistle’s 1923 Catalog advertising The Johnny Pumpkin Head Family.